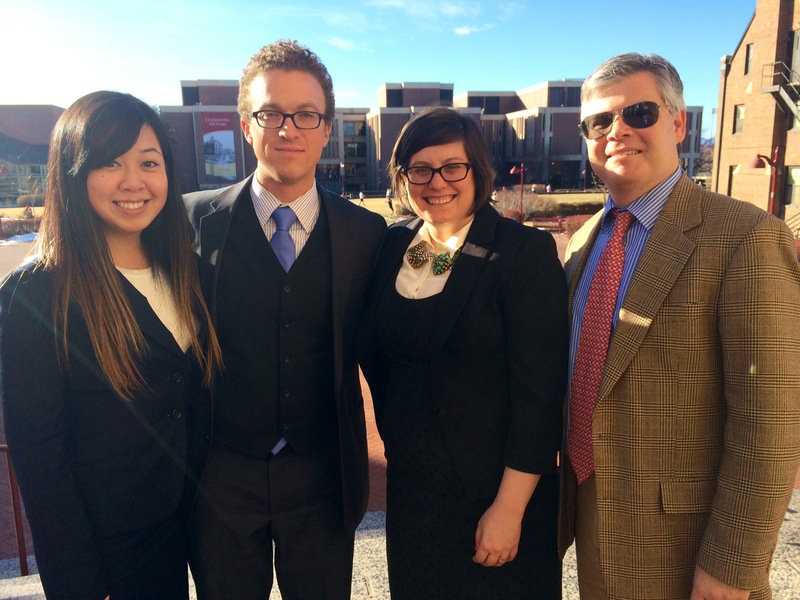 Congratulations to the Pace Int’l Environmental Moot Court Team! Our CONGRATULATIONS goes to the Pace IEMC Team that advanced to semi-finals and took Third Place for Best Memorial! The 18th Annual Stetson International Environmental Moot Competition (regional rounds) took place at the Sturm College of Law at the University of Denver, Colorado on January 24-26, 2014. Prof. Matt E. B. Brotmann coached this year team which comprised of Megan Hopper-Rebegea (3L), Ellen Zhang (3L) and Charter Williams (2L). The team advanced to the semi-final rounds; the team’s oralists, Ellen Zhang and Charter Williams did an exceptional job in advancing to the semi-finals, knocking off last year’s champions. In addition to the results achieved in the oral rounds, the team’s memorial, written by Megan Hopper-Rebegea received Third Place for Best Memorial. The team’s impressive performance was a true team effort. The team would like to thank the many faculty and friends who helped them prepare for the moot including Prof. Ann Powers, Prof. Peter Widulski, Prof. Lucie Olejnikova and 2013 team member Joan Colloton (3L). Join the law library in congratulating the Pace 2013 Int’l Environmental Moot Court Team on their excellent achievement! Next Congratulations to the 2014 Pace Jessup Team!